"There's life in other worlds. Maybe they'll come to Earth helping man to find a way..."
Something occurred to me about yet another way that evolutionary thinking has led to a tremendous waste of time and money: SETI. The whole thing is silly, with astronomical (heh!) odds against finding signals from intelligent life "out there". There are all sorts of excuses and wishful thinking masquerading as science that stretches credulity, but frankly, that's what evolutionism is: Accept their authority by faith, suspend your common sense and disbelief. 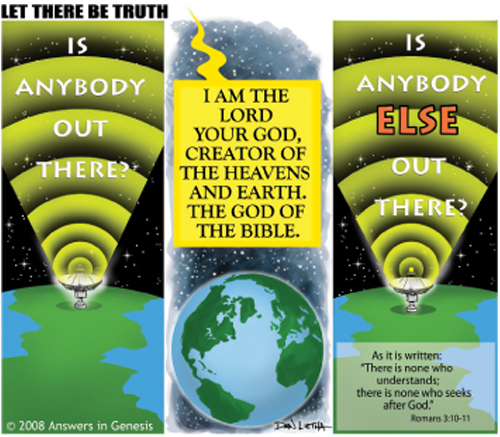 Scores of assumptions are made and connected regarding the origin of the universe (using the current popular premise of the Big Bang). The "odds are" that since life evolved on Earth, then life must have evolved elsewhere in the universe. Further, since the universe is ancient, they must be more evolved than we are. After all, us humans are constantly evolving and getting more better all the time, yes? Just look at how wonderful we are in idealized "Star Trek" visions. Of course, the "advanced" 20th century gave "advanced" means of killing people. Using "advanced" intellectual thought of the 19th century (such as ideas of Darwin, Marx and Nietzsche) and "improving" these philosophies in the 20th century, atheistic communism eradicated around a hundred million people. Eugenicists like George Bernard Shaw, Bertrand Russell, Margaret Sanger, Adolph Hitler and others met the approval of the intelligentsia. "Survival of the fittest" means removing the unfit, does it not? Even if it did exist, would you really want to meet an alien race that has "evolved"? After all, evolution is supposedly a natural process; if it happened here, it happened "out there" in much the same way. Instead of the benevolent advanced race, they may not be interested in helping us advance. Or... they may be interested in helping us "evolve" by eliminating what they deem unfit: Humanity itself. EDIT: Here is my April 2016 article on people who want to hide from supposed space aliens. The extraterrestrials would probably be far in advance of us. The history of advanced races meeting more primitive people on this planet is not very happy, and they were the same species. I think we should keep our heads low. Would that not be taking Darwin's philosophies to their logical conclusion? Maybe they're mischief makers that you wouldn't want to be riding the trail with... As the saying goes, "I'm just sayin'".